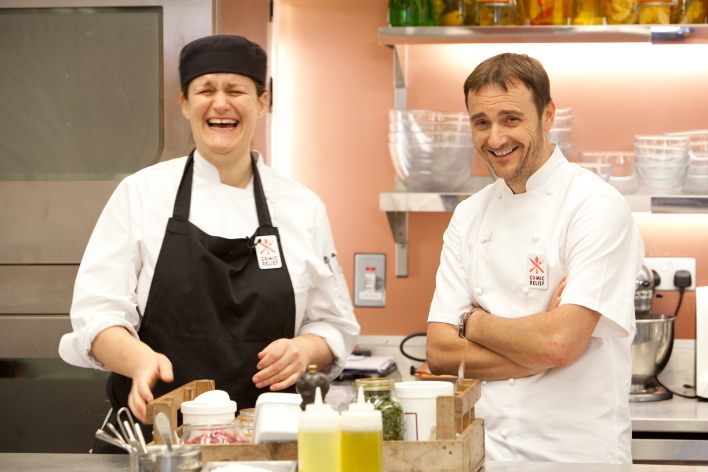 The Great British menu is back and this time the banquet is to celebrate comic relief and all that it does to help the lives of people in Great Britain and Africa. So what a brief for this year’s competition and I must admit I love a good laugh so it seemed made for me! 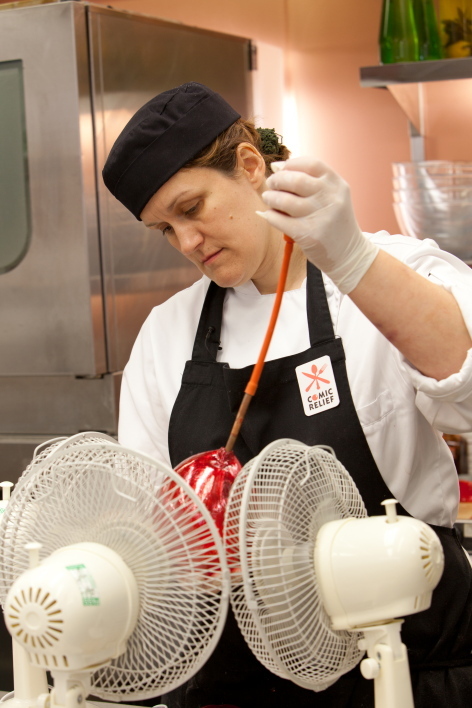 Having competed twice before the pressure was well and truly on- The Chefs who enter this competition have to be up for a serious challenge and know the pressure you are under! I think it shows on our faces! 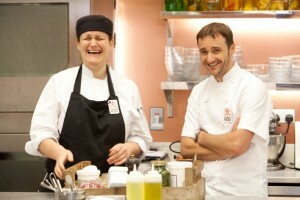 The Great British Menu definitely gets under your skin and everyone around you gets sucked in too! There really is no place to hide doing this show it is great fun, very intense and totally the biggest adrenalin rush you will ever get as a chef! I loved it!!! The amazing effort by those I love has been rewarded by various meals of Great British Menu dishes! They know them all as well as me! And better still know all about the washing up! Thank you. There are so many people to thank for their help and supplying stunning produce. To compete is something I have always enjoyed and relished the chance this year to show off my humorous side and cook using some of Yorkshire and beyond’ s finest suppliers. Thank you to all the suppliers of my food for the Great British Menu and also thank you below to the people who guided me along the way! www.ruddingpark.co.uk Continued support in my Great British Menu challenge. Simon , Judi, Peter, Nuno, Eddie, Nicola, Jennie ,Paul and all the team your help and support and encouragement spurred me on to have another go. Thank you for the dinner too Simon, Judi and Peter and inviting guests to join our tasting team. Gary Flatt and Paul and Valda Goodfellow – http://www.goodfshop.net/ Gary kept me inspired with ideas for plates and the Road for my chicken dish. You are great and thanks for sponsoring me in my heat I love the portfolio of amazing plates and dishes. Starter platters, fish plates, main plates and dessert too you got the lot guys! What these guys do not know is not worth knowing! Thank you for all your support and encouragement + teaching me how to pull sugar! Stunning herbs some cracking specials and bags of enthusiasm the produce shone in London guy’s thank you. Herbs, salads and flowers – you did me proud. Nick, Lorna Chippindale and Helen http://www.chippindalefoods.co.uk/ It is all about the eggs – wholesome lovely and local. I hope you like what I did with them! Cracking!!! Nigel Sampson http://www.hfv.co.uk/ Amazing Venison Nigel loved the T Bone as a cut and loved the quality. Looking around the factory was superb and meeting the team they gave me exactly what I wanted. All the Shepherds purse cheeses are classic and Harrogate Blue is a favorite of mine being a Harrogate lady it was great to keep it local! It was amazing to be at the Launch of this stunning cheese last year and watch it get delivered all over now! What a guy a real food hero in the North loved the produce Ken. Beetroot beauties! I loved it and the Wasabi peas were lifted to the next level well done Jon and your team. Paul love the fish, love the passion for all sea products. Stunning Whitby Crab and lots of it! Samfire is not bad either guys! Edward Wilkinson – http://herbfedpoultry.co.uk/about-2/ Stunning Chickens Ed I hope this is your year with this amazing product – if you have never tried one of Ed’s birds it is a real culinary achievement the flavor of this juicy Chicken is memorable. James and team -Stunning produce and major supplier of every chef on the Great British Menu your products are exemplary and wow what service. If Jonny Baron cannot find it – it does not exist! Rupert and Wendy I know your products have been widely used on the Great British Menu this year but being a fan for many years I can see why! Sally Ann, and Geoff what can I say always loved this product and the lemon oil is stunning. Getting to know you guys is the icing on the cake and cooking for your daughter’s wedding was a real pleasure. Raspberry dehydrated and Pistachio’s and all other products top draw chef! All the team at www.leedscitycollege.ac.uk for all your enthusiasm for what I am doing. Lewis Barker- I know you are in Australia now dude. You were a great sounding board and good to cook with you for a morning at Rudding Park, with the foraging and golf buggys! Kev the potter from Knarsborough for not giving up with the porcelain Hands when they all cracked in the Kiln and getting me what I was after –boss I hope you like the dish! Once again to all the Team at Rudding Park for being so supportive.